Baybayin Modern Fonts: On your mark, get set, xo! The great baybayin kudlit race begins. It seems strange to me that any purist would seriously consider the baybayin to be "good as it is" purely because the cross kudlit is a "horrific reminder of the past". 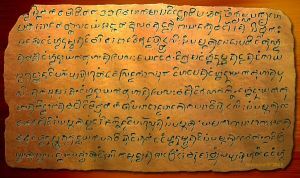 As you say, the virama has precedence in other Indic scripts, even some of our closest neighbors, such as the Balinese and the Javanese make use of it. Clearly if a script without one is "fine as it is" they would have given up such an "unnecessary" mark. I believe that most of these purists are not entirely linguistically aware that all vowels, consonant clusters, and final consonants are important for reading a Philippine text without major errors in understanding. 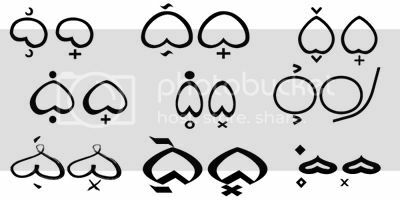 If Baybayin is to be returned to a modern script, it MUST be able to represent Philippine languages mostly unambiguously (I am willing to allow a margin of ambiguity, as not all writing systems are exactly phonetic). Part of this is introducing a virama into it. It does not have to be a cross, it can be something as simple as a long dash slanting as in Devanagari.